And for the other one we would at least need pin pitch (x and y direction) and pin sizes. Maybe also the outside dimension of the switch. 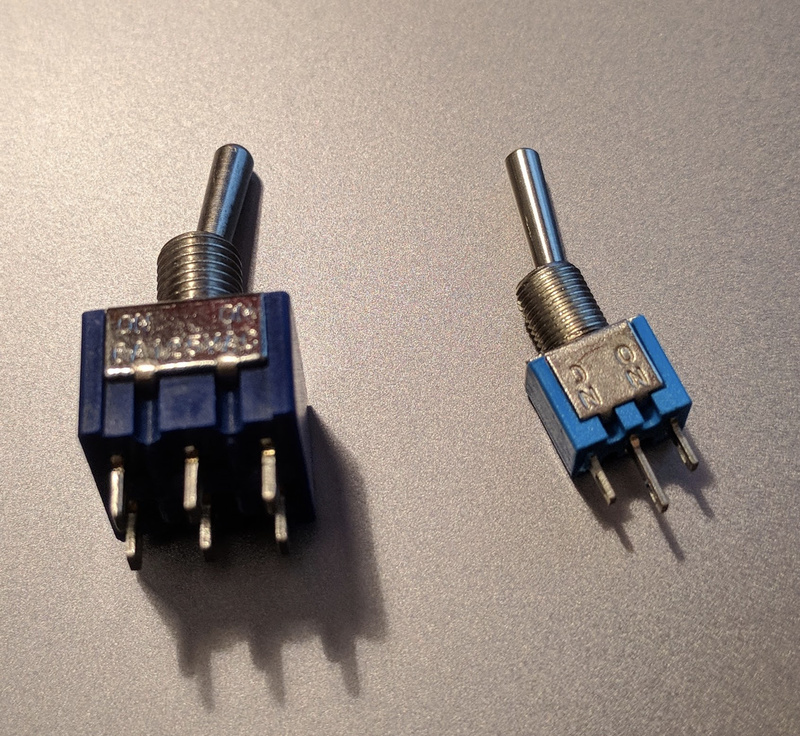 Thing is I have a bunch of these and I don’t really see a reason not to use them as PCB mount. These are very small and light PCBs that will be carried by the frontpanel mounted components such as jacks and pots anyway. Oh, it was actually easier than I thought to do the footprints. Oh, it was actually easier than I thought to do the footprints . . . . .
It’s possible to mount either of those switch styles on a PC board. Sometimes the switch becomes the major means of support for the board. Take a careful look (or have your mechanical designer take a look) at how the forces are transmitted, both static load and when the switch is operated. For long-term reliability you want to avoid stresses on the solder joints. Your next task is to find a board fabricator who will do those elongated holes without a surcharge. Oh, crap, didn’t think of that. I’ll should probably make 'em round? This is just me building an analog modular synth for fun so we’re talking oshpark/dirtypcbs or any of the super cheap Chinese fabricators. I guess they want to drill holes and not mill them? But on topic, yes, I’ll probably just keep my own lib of footprints and import even the standard ones into it. My drawers aren’t that full actually and it’s sometimes rather hard to navigate the full standard lib so probably just better to add the stuff I have. I have ordered TL072CDR and TL074CDR’s which are dual/quad opamps in SOIC package. 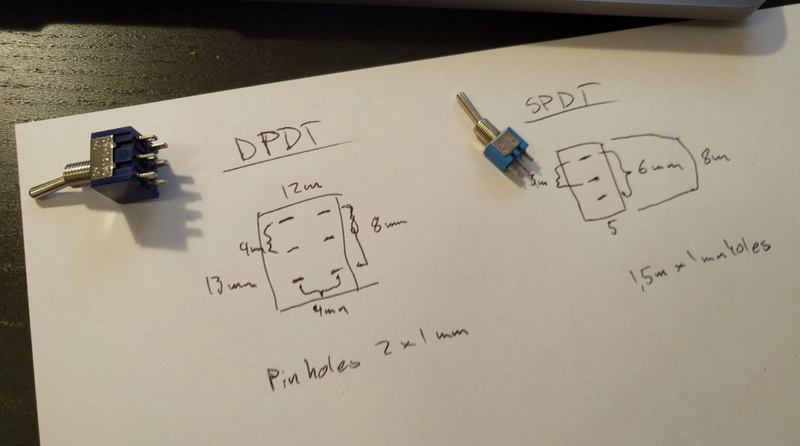 The Housings_SOIC:SOIC-14_3.9x8.7mm_Pitch1.27mm seems to match up with the datasheet, but there is no SOIC-8 anymore…? The SO-8 in the same library seems to wide? SOIC-8 should be super duper standard, shouldn’t it? I don’t know about the others, but for OSH Park, see their “slots” page. It appears they can do plated slots, but they aren’t officially supported, and you have to put the slots on the Edge.Cuts layer, rather than just representing them as oval holes. I use OSH Park and always use circular holes, because this seems intimidating to me. The board mount barrel connector uses slots and I had no problems with that at a low end Chinese board house. And to answer that one… right click on the background/canvas… the menu will let you chose a grid spacing. To completely shut it off … hmm … scratches head … I can’t find an option for that? Yeah, best i can see is to use custom grid and set it to the smallest allowed. If you are talking about the footprint editor hold shift+ctrl to disable snapping to grid. Sorry, doesn’t work on my OSX. I could still get some work done by simply moving with numbers but for silckreen markings I would really want to be able to move stuff around visually, seems just impossible on OSX. I’m not sure how just setting the grid to the lowest size possible doesn’t work for this. I don’t go anywhere near the smallest when I want to place stuff that really doesn’t need to be grid aligned (like silk screen elements) and that works well enough. I’m not sure how just setting the grid to the lowest size possible doesn’t work for this. I set the custom grid to 0.001mm and if that is still “snapping” I just don’t see it; unless it is zoomed all the way in. At that point, I have to get close to the monitor to even see the actual minimal snapping. I wonder if there isn’t possible a hardware display issue where the cursor is having a hard time keeping up with the pointer. Setting grid to 0.01mm (there’s no 0.001?) works for me, thanks. Wasn’t aware this was the way it worked. In most similar software snapping and visual grid are separate settings. I would prefer that actually since I would like to keep the grid as a visual guideline while still being able to move/draw without snapping. But good enough!